110 HP ProStar® 1000 H.O. For 2015 we wanted even more power and torque! So we tweaked the cams, installed bigger valve springs, raised the compression and optimized the fuel map to give you 110 horses of High Output power. Dual overhead cams (DOHC) actuate four-oversized valves per cylinder, slamming a huge fuel charge into the combustion chambers of the engine for maximum performance. Designed specifically for extreme performance, the Polaris ProStar® 1000 engine features 999ccs of big bore twin displacement and all of the hallmark ProStar® features. This includes dual overhead cams, electronic fuel injection, and 4 valves per cylinder. 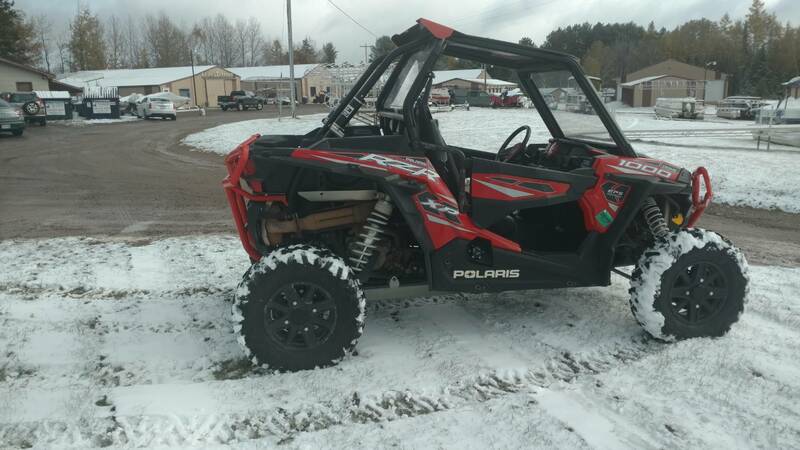 It also features 48MM throttle bodies and long-tip fuel injectors giving the 2015 RZR XP 1000 instant throttle response, quick to rev characteristics, and the highest horsepower in the sport SxS market. All-day comfort and high-performance support highlight the RZR XP 1000 performance comfort seat. Deep side bolsters keep both driver and passenger secure and ready to tackle any terrain, while 50% more padding provides superior comfort. Easy to adjust driver’s and passenger seat slider makes for quick comfort. Not to mention, the waterproof internal membrane on the seat makes for a drier ride leading to the best seats on the market. 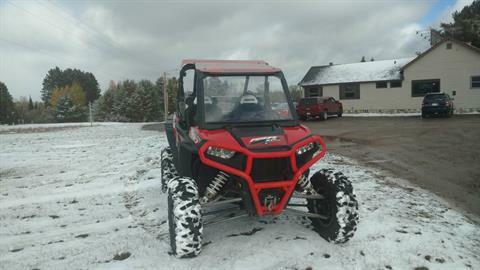 The cockpit of the RZR XP 1000 offers the most comfort and convenience of any RZR. A High Performance steering wheel with 10" tilt adjustability and center storage box with cell-phone holder place everything within reach, including the re-designed glovebox with a quick turn latch. Driver and passenger footrests and adjustable seat sliders allows you to fine tune your seating position and Dryseat technology resists moisture, while LED interior lighting adds a touch of style. 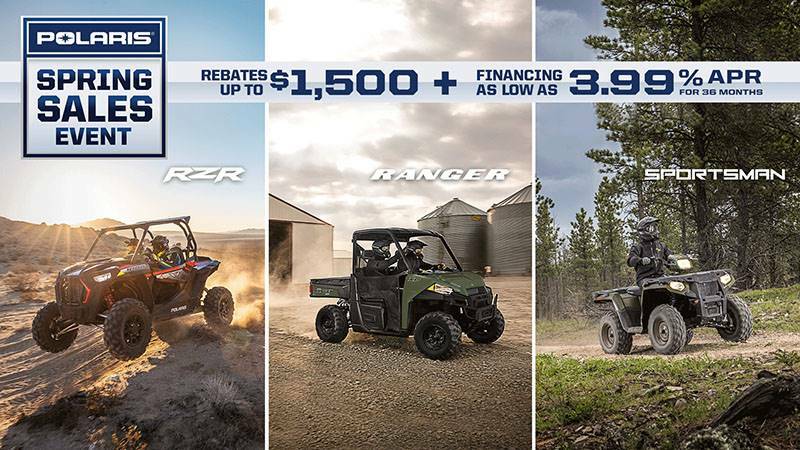 It’s now easier than ever to get behind the wheel of a Polaris RZR thanks to factory installed quarter –doors and their spacious curved design. The doors feature an easy to access latch and striker assembly for one-hand operation; arched mid-point design for greater cockpit space and elbow room inside and bolster protection from debris on the outside; and can be easily outfitted with a host of integrated accessories. The High Performance True On-Demand True All-Wheel Drive System is revamped with an 80 percent improvement in strength over the standard system. The result is the most durable front drive system ever found on a RZR. The system features close ratio final drive to keep the front wheels pulling stronger and longer maximizing power delivery to the ground on even the loosest terrain. The reduction provides increased traction without sacrificing steering effort to provide unmatched point-and-shoot handling. We've completely re-designed the clutch cover, secondary helix and ducting system to offer the most durable clutch system ever on the RZR XP 1000. New ducting provides twice as much airflow and decreases belt temperature by up to 50 degrees. 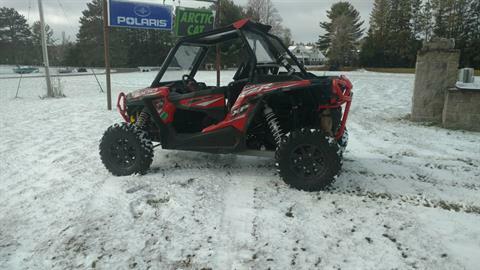 The RZR XP 1000 is built upon a 90-inch wheelbase and 13.5-inches of ground clearance. The chassis and suspension combo smoothes the harshest terrain without unwanted chassis pitch; and delivers unmatched control and comfort without sacrificing agility. Giving you our legendary razor sharp handling even in the most challenging terrain. The dual A-arm front suspension on the RZR XP 1000 delivers a plush 16-inches of travel and features a dual coil-over spring design. By using two individual springs and a crossover point versus a single dual rate spring, the RZR XP 1000 delivers a smooth, precise ride no matter the terrain. Industry-exclusive Walker Evans needle shocks deliver next level performance and tuning capabilities. Aside from the ingenious anti-bottom needle technology, the 2.5-inch diameter rear shocks have been completely re-tuned for 2015 for a better ride and increased durability and feature tool-less 16-position compression dampening control, allowing you to tune for the perfect ride for any condition. A race-inspired 3-link rear suspension maximizes acceleration, sharpens control, and improves straight-line tracking by keeping the tires in contact with the ground more often. Polaris redesigned the already best-in-class 3-link suspension introduced in 2011 with revised geometry to offer 25% more ground clearance from leading edge of tire in regards to the trailering arm; optimized camber gain for improved traction; and a longer trailing arm for added strength. Revised front suspension geometry and standard Electronic Power Steering (EPS) results in less steering effort and delivers the ultimate in control with reduced rider fatigue. The most advanced suspension for the most control and smoothest ride at any speed with 16" of front travel , 18" in the rear with dual rate springs and remote reservoirs. The race-inspired 3-link trailing arm rear suspension serves up an incredible 18-inches of rear wheel travel. 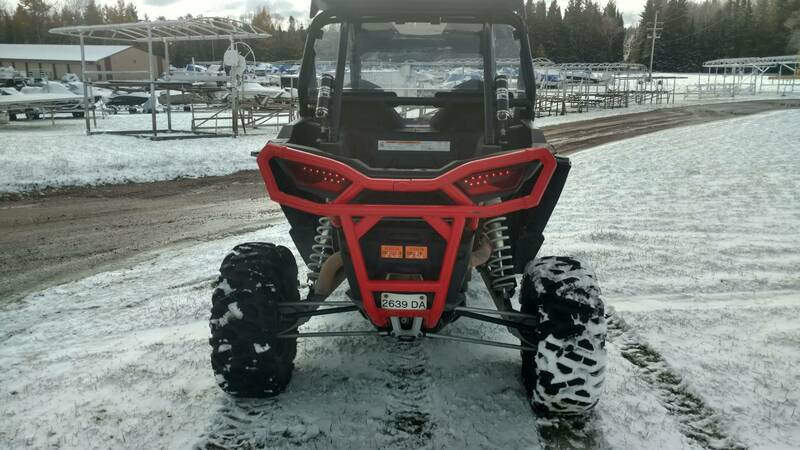 Matched to an astounding 16-inches of front suspension travel and 13.5-inches of ground clearance, the king of the RZR family conquers the worst terrain Mother Nature has to offer.